Rose Mary Salum: You decided to translate Francisco I. Madero's Spiritist Manual 100 years after it first was published. What triggered your desire to work on this project when, even at the time the book was released, he was mocked in newspapers as a crazy man who talked until he was blue on the face? CMMayo: The decision was not something I thought out-- it was intuitive, sudden, and strangely compelling. Though I'd been living in Mexico on and off for over two decades, I hadn't given much thought to Madero or the Revolution; my interest in recent years has been the French Intervention (the subject of my novel). What happened was, to make a long story short, I had the opportunity to view Madero's archive in Hacienda (Mexican Ministry of Finance), and when I saw the Manual espírita, I knew it needed to be translated. Before I could stop myself, I offered to do it. Because of my previous research on the French Intervention, I had a keen appreciation for the need to translate basic works. So much history is badly misunderstood or not even acnowledged for want of a translation! And the fact is, Madero was the leader of Mexico's 1910 Revolution and his Spiritist Manual, completed in that same year, though published in early 1911, is a statement of his personal and political philosophy. Ergo, it is a basic document for understanding both Madero himself and the Revolution. RMS: What is your personal opinion on Madero´s beliefs and this book after you´ve gotten so close to it? CMM: I really had a rollercoaster of a ride with this, from thinking he was naive, wise, good, nuts, way ahead of his time, an old fuddy-duddy, heroic, daring... If you were to ask me a year now I might say something very different but right now, January 2012, my take on him and his beliefs is this: I don't think he was crazy; he would not have been able to achieve what he did as a businessman and political leader without his druthers. As for his Spiritism, whatever one may think of it, the fact is it was not something he invented but adopted. (Note: it is similar to but not the same as Spiritualism.) Though always at the far esoteric margins of mainstream thinking, in the late 19th century when he was studying in France and first took it seriously, Spiritism had developed a large following and the main books by Allen Kardec were all relatively easy to find. (Madero's own father had a subscription to the Spiritist magazine, Revue esprít.) Apart from reading the classics by Kardec (Book of the Spirits, The Book on Mediums, and others), Madero also adopted ideas from Edouard Schuré, who claimed to have relied a Greek medium to channel information about Hermes, Krishna, and Jesus, among other "divine messengers." Much better known in France than in the US or Mexico, Schuré was a close friend of the composer Wagner and also a friend and colleague of Rudolph Steiner, the founder of Anthroposophy and the Waldorf schools. In sum, Madero's Manual Espírita should be considered as a work solidly within European esoteric traditions. RMS: Allow me to pose the same question you ask in your video: can a secret book get its author killed? Why? C.M. : I pose it as a question, suggesting that this may have been the case. What we do know is that when Huerta staged the coup and had President Madero arrested, he and U.S. 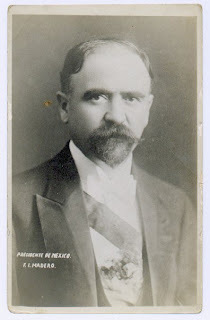 Ambassador Wilson discussed what to do with their prisoner-- put him in a lunatic asylum?I think a good argument can be made that, like many people, Huerta and Wilson held Spiritism in deep contempt and that very contempt made it that much easier to kill Madero. When I say "secret" book I mean it in the sense that Madero tried to keep his identity as author secret by using a pen name, Bhima. But the book itself was not meant to be secret, quite the contrary: it had a print run of 5,000--- very substantial for the time--- and its very purpose was to evangelize. RMS: What were the consequences of publishing this book at that time? CMM: I don't think there is a definitve answer because I think it is the nature of a book-- a thoughtform in a package (whether paper or digital) that allows it to travel through time and space-- to enter into reader's mind individually and privately. Who actually reads it? When do they read it? Where do they read it? How attentively, and how thoughtfully? I just finished reading War and Peace. Well, how do you know I actually read it? You just have to believe me. And here I am in 2012 in Mexico City-- far from being the reader Tolstoy envisioned when he published it in 1869! But OK, I'll take a flying guess: I think the consequences of Madero's publishing the Spiritist Manual were extremely damaging to his political career and personal prestige because any and all Spiritist activity was extremely disturbing to most people in positions of authority at that time. I should underline here that the Catholic Church considered the seance, a key ritual in Spiritism, to be communing with the Devil and the Vatican had banned all works by Allen Kardec, Spiritsm's founder. For any political leader in Mexico at that time, accepting, never mind espousing Spiritism, was to venture far beyond the pale of the acceptable. That said, Spiritism did have adherents, among them, Ignacio Mariscal, and in France, such well-known intellectuals as Victor Hugo and Flammarion. No doubt, somewhere in Mexico, some people, perhaps a few hundred, read the Manual espírita and found it both convincing and consoling. Perhaps someone else could answer this question better than I can. RMS: You mention in your introduction that Madero´s book is one of the earliest Spanish language manifestos of this new religion. What other books on the same subject were printed in Mexico after that? CMM: I am more familiar with what was published before that, primarily translations of works by Allen Kardec and other French Spiritists. After Madero, Spiritism in Mexico, as in Brazil and the Philippines, has taken on its individual character, mixed in with indigenous and other traditions, over the 20th and into the 21st centuries. Apart from Madero himself—and also in a distinctly more rustic vein—El Niño Fidencio is considered Mexico's best known Spiritist, though it would more accurate to say that he was associated with Spiritism. I talk about this at length here. RMS: This is a question from an editor´s point of view: Is there a market for this book in the English speaking language? CMM: There is a market for anything on Madero and the Mexican Revolution in English, albeit a slender one, and this is why I decided to do a digital edition. I have had some interest in the book from Spiritists, but as I have not been connected with that community it is hard for me to gauge. I am thinking about other editions and possibilities; I would like to see it in paper with a proper spine. RSM: How has your experience been so far with your first eBook? CMM: After having published several books with various pubishers, it was wicked fun to design the covers and the website without having anyone second guess or even block my choices. On the other hand, I have a renewed appreciation for the sometimes ginormous amount of tedious work editors and marketing staff do for a book. It's encouraging to see how quickly and easily one can sell a book on amazon.com, however. I am also thrilled to see what iBooks are turning into--- much more interesting than amazon's Kindle. RSM: Will you publish more eBooks? CMM: Yes, and in fact I have two almost ready right now-- a short story, "Manta Ray," and Marie de la Fere's My Recollections of Maximilian, a brief eyewitness memoir of Maximilian von Habsburg. Right now the way I see it, each book has its own destiny: some may be best off placed with a commercial publisher, while others may be best self-published, and perhaps only digitally. What's exciting is that with the very low cost of digital publishing, so many books that would not have been feasible to publish can now come out of their boxes and drawers and musty old archives. As a reader, I am in heaven! RSM: Could you advise our readers when and where to get this and the other books you plan to launch?